As a fellow iOS Developer you might find yourself in San Francisco for WWDC or maybe on assignment. If you’re like me then you cannot survive with a modicum of connectivity. Unfortunately AT&T has visitors jump through hoops and has loads of horror stories in stock to deter people from getting what they really want. Thanks to my sponsors at Scribd I’m here in San Francisco for the second time this year and I would like to summarize what I have learned about your options when it comes to getting affordable wireless data for the short time you’ll be in the USA. So far I have found two viable options, the easier one being with T-Mobile, the harder but ultimately more enjoyable one going via the main iPhone carrier in the US, AT&T. T-Mobile is making quite some business it seems as in most locations where you have an AT&T retail store you find a T-Mobile shop quite near, often just across the street. This is the case at the stores that are closest to the Market Street. When I tried the first time, obviously, I wanted to enter the AT&T store first, but they had already closed for the day, T-Mobile has longer hours. At the mentioned location the manager has a professional Sim-Card cutter handy and is only too willing to convert a Web2Go Sim card for the iPhone 4 format. There’s one caveat: due to T-Mobile using an unusual 3G frequency you won’t get 3G data with them. You want to get the regular prepaid deal that has access to the unlimited day passes. This is an option that you have to activate every 24 hours, but then you get unlimited EDGE for the duration for a rock bottom rate of $1.49 per day. EDGE is only like slightly more than 100kbps, but that’s still sufficient to navigate around San Francisco with the maps app, tweet a lot and have your mails pushed to you. Unlimited peace of mind. You quickly get used to going to the special URL (that still works) and activating another 24 hours from your balance. I was told that the balance expires after a certain number of days, but when I returned outside of this period, I still found my balance intact. The only thing that did not work was being redirected to the URL for activating another day pass. But with some friendly in-store help we got this working again, it turns out that with the direct URL I could simply reactivate the service. If you are a bit more on the adventurous side, then you’ll get bored with the simplicity of T-Mobile. That’s where you need to go. If you are a true iPhone fan, then you’ll also endure the lack of competence on behalf of the AT&T store staff. It actually took me three trips to three stores to get to my final (successful) result. If you just enter a store without some mental preparation (that this blog post aims to provide) then you will hear one or more of the following stories, let me also add where the grain of truth is contained. – not true, you are. You’re just not SUPPORTING it. – if you don’t modify the APN settings that might be true. But there are tools to do that which makes it only half-true, namely for n00bs. – LOL, the proof for this was one guy that synched his entire mailbox from scratch and found himself out of credit after 100 MB or so. – that might be true, because the only Micro-SIMs that AT&T stores carry are the packages needed for the iPad and replacements for contract-bound iPhone 4. They are not allowed to sell you a Micro-SIM as prepaid. You basically have two options: 1) to either jump through these hoops with keeping a straight face face while specifically stating that they don’t have to care what phone you put the card into and that you assume all risk they just should let you have a new prepaid account and sell you a regular SIM card. You will then take care of the necessary modifications yourself. 2) to not go into a corporate AT&T store but to pay a visit to the numerous independent vendors, who are only too happy to help you. 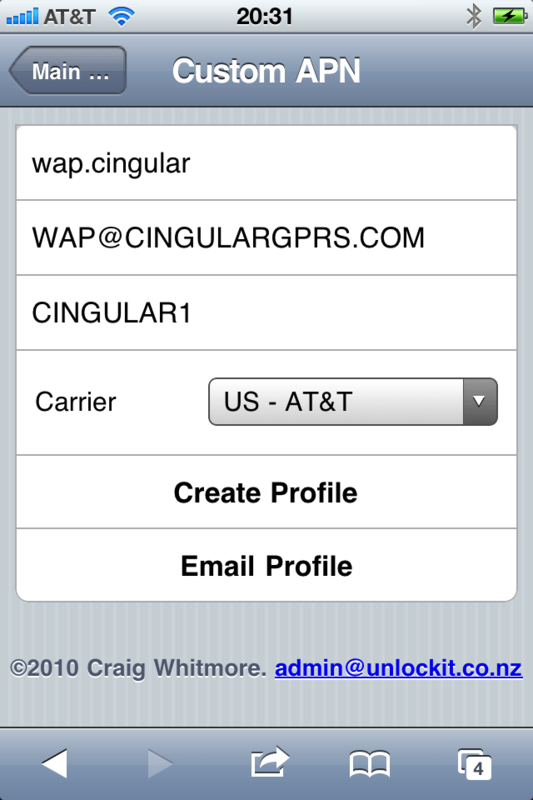 Here are the ingredients I used for getting AT&T prepaid data on my iPhone 4. The minimum initial charge is $25, from these the people in the store activated the 100 MB package for $15. You can also do that later, but I found it more convenient to have this done in store already. iPhone 4 users now have to convert the regular size SIM into a Micro-SIM. This can be done – if you are brave – with scissors based on a template, or with a SIM cutter. The last step is best done if you have an alternate internet connection, like Hotel WiFi. I used the APN Changer online tool to create a profile to set my APN. An alternate route is to do this manually with the official Enterprise Configuration Utility. And if you are in the Fisherman’s Wharf area, you can have the full service option from Fernando Cortes who runs a small phone shop (AT&T Affiliate) on 2056 Chestnut Street. It’s a bit out of the way but he’s open on weekends too, so I can definitely recommend that you go the distance if you don’t want to hear silly stories and combine the procurement of 3G data with a visit to the Wharf. There might be one other option: some people have gotten replacement iPhone 4 SIMs claiming that theirs was broken. But I prefer to stick to the truth, it shall set you free. One more note: Your prepaid balance expires if you don’t refill periodically. The expiration durations are 30 days for less than $25, $25 through $75 expire in 90 days and $100 refill expires in 365 days. So if you know that you’d like to come back to next year’s WWDC, then you’ll either have to start the dance from scratch or keep your account alive by adding credit to it every couple of months. I’m thinking about topping it off for $100 once before I leave and then be done with it. Update June 4th, a week later: Now my first 100 MB were used up, so I refilled my account via credit card for $100 (to get the 365 days non-expiration) and from these I used $25 for 500 MB MB. That should be more than enough to get me over WWDC and the navigating/twittering for my second week in San Francisco. Great! I had a lot of doubts on prepaid data plans on USA! Thanks for the up-to-date information on AT&T. I just visited the AT&T web site today (July 20), will the $50/month unlimited-everything plan work with a GoPhone SIM bought on Ebay, cuz there are AT&T Microsims available there for $5-$6. Also, I live in Canada, do you need to physically visit an AT&T store in the US to activate the SIM, or can I do this from home by (land) phone, and pay with a Canadian credit card ? Oh, and another question : what is the exact process to get your phone to work back home with your original SIM ? I activated all in a store, at home I exchanged the sim and removed the APN settings. I just realized that the $50/month plan does NOT include data. Is there a better deal out there than $25 for 500 MB ? You’ll have to check out the plans available on the AT&T website. Jack, how does it finally worked ? Is it possible to buy just the sim card ? How much it cost ? Great, great post! It’s something I have never thought about, really, but it makes a whole lot of sense. Thanks for sharing information related to Prepaid 3G Data for Visitors to the USA – Truth and Fiction and 3g data card. I just bought the Pay as you go 25$ and 25$ data package. Followed instructions above and now all working as stated above. My iphone 4 is factory unlock btw. At&t staff will tell you it wont work but just tell them its your risk anyway. Bought another SIM for a 3GS and its working too minus the data. Im from Manila Philippines and this is a huge saver for my roaming fees. Also the cell service works with Samsung Galaxy Mini Android which then again doubted by the staff to work. But I showed him and he was surprised. Thanks to Drops and this blog its a big help. Thank you so much for posting this great tip! I just activated my iPhone 4S (unlocked version) with ATT prepaid plan and the data package is working flawlessly. Thank you soooo much for this info. My iPhone has data! AT&T fed me some bs today at the store but I just cut my old card, put it in, tried the above link and it works! Thanks for this! I was stuck with T-Mobile’s Edge which is more expensive and slower. Yesterday I went to the AT&T store and got my GoPhone card and now I’m surfing with 3G from my iPhone 4S (although it says 4G, AT&T are very flexible with the truth it seems). I actually Flattr’d this post for the next three upcoming months because a) I can’t believe nobody’s done it yet and b) it worked. Thanks again! Ok so I just wanted to help out any fellow Australians out there travelling to the USA and wanting to use their iPhone, iPad, Samsung etc etc on pre-paid. Get a local sim card in the USA. Be prepared for AT&T to give you great grief, particularly if you’re using an iPhone! You can buy a proper micro sim in Australia before you go from http://www.usaprepaidsimcard.com.au. Comes with instructions too about how to activate it here in Australia BEFORE you leave, and add credit too. And YES it does work on an iPhone and it has pre-paid 3G data ($25 for 1GB). If you have an iPad 3 then you’ll also get proper 4G data too. May I also suggest checking out http://www.boingo.com for your laptop – although there’s a lot of free wi-fi in the USA, there’s a lot of paid hotspots too, particularly in higher class hotels and airports. Boingo.com basically roam onto almost all paid hotspots in the USA. Their plans cost around $15 per month for unlimited wi-fi. And don’t forget when in the USA eat lots of Mexican food because I can tell you there’s very little authentic Mexican food here in Australia! Hi – so I was curious to try this with my unlocked iPhone 5 from New Zealand (given that its been almost a year since you originally posted). -Page Plus – looks awesome because it uses verizon’s network, and there is a plan for 29.95 per month that would almost cut it. It was looking sketchy as to whether I could activate an iPhone 5 without a bit of hassle, so I bailed. As far as I can tell there is no reliable way to get a prepay verizon sim for iPhone. -Other reseller pre pay options seemed to come in at around $55 per month minimum (and were on AT&T’s network). Maybe slightly different allowances, but essentially the same price as AT&Ts cheapest prepay option for data. -Forget T-Mobile.. in NYC especially I think you are on ‘edge’ (non 3g) mostly and it sux.. I went into an AT&T store and did my best to be vague about what phone I had. Just asked for a sim on the pay as you go plan (no monthly fee, 10c per minute calling). The guy may have been lying but he was adamant that there was no way to add data to that plan. The best he would offer was a $25 monthly plan (250 anytime minutes, unlimited text), then a 1GB data add on for $25. On the plus side the data add on doesn’t expire so 1GB can potentially stretch over 2-3 months depending on how i use it. So I got a micro sim (no nanos for this), loaded it with $50 for my first month + 1GB of data. A visit to unlockit.co.nz and the APN settings were in. Seems to be working nicely and tells me its on 4G. I guess in really heavy data months (say for SXSW) I might end up paying $50 for 2GB of data. Seems pretty good, would be interested to hear if anyone has recently managed to get a cheaper deal without the ongoing $25 per month. The part about this is where you’re buying voice/data out of a ‘bucket.’ So if you do no voice at 10 cents / minute you get to shift it all for buying data packages. As of March, 2012 AT&T is no longer offering/allowing this. The 10 cents per minute will not allow registration of a ‘smart’ phone. You are forced to the $25 per month (use it or lose it) and then purchase data at $5/15/25 that does roll over with each monthly data purchase.